What is Science Fiction, anyway? A lot of people tell me they aren’t really interested in SF. They’re wrong. The problem is that SF means different things to different people. James Bond movies draw huge audiences, but I’d be willing to bet that if you hung around the concession stand and polled the people waiting in line to buy popcorn, nine out of ten would look puzzled if you suggested they were fans of SF. Ahem. Dr. No: evil plot with atomic powered laser. You Only Live Twice: evil plot to abduct spacecraft. On Her Majesty’s Secret Service: evil plot to deploy biological warfare through brainwashing. Diamonds Are Forever: evil plot to use orbiting laser weapons platform. The Man With the Golden Gun: evil plot to suppress solar energy. The Spy Who Loved Me: evil plot to provoke nuclear war and build future utopia. Moonraker: evil plot to wipe out humanity with nerve gas from space station. A View to a Kill: evil plot to destroy Silicon Valley and monopolize microchips. GoldenEye: evil plot to negate Electro-Magnetic Pulse defenses and subvert satellite weapons. There is a huge disconnect, I think, between what is SF and what is marketed as SF. No-one has trouble identifying Jurassic Park as SF. DNA has science like rice has white. But Michael Crichton markets his books as best-sellers, avoiding the SF label and the geek shelves in bookstores. Margaret Atwood would rather be known as an author of literature than SF, although The Handmaid’s Tale is every bit as dystopian as The Hunger Games. The strictest definition, espoused by people like Canadian SF icon Robert J. Sawyer, is that Science Fiction is fiction about science. It’s a simple and elegant definition, but it can be surprisingly exclusive. Rob argues that Star Wars is not about science. He considers it Fantasy, because the Force is essentially mystical. Yes, there is a veneer of scientific technobabble to justify it, but it’s lip service. By the same rigorous standard, he rules out most of Anne McCaffery’s work. Pern may have been a lost and regressed colony planet, but that wasn’t essential to the story. Which is not to say he didn’t like Anne, they were friends. By the way, Rob does his homework, and if you want to read something that showcases his take on SF, I was blown away by his melding of science and characters in Wake, Watch and Wonder, aka his WWW series. I have an online critiquing partner who is vigilant in looking for supposed SF stories that could be retold without the science. This is useful, but if you take it to extremes, even Asimov’s I Robot could be redone as a fantasy about Golems, with three binding spells of Golemics providing the plot foundations. What of Star Trek? TOS got off to a strong start, the first episode was about silicate life-forms. Later episodes about the shoot-out at the OK Corral, Nazi Germany and the Roman Empire pretty much fell off the wagon, in my view. For me, the entire franchise got obsessed with pitting Team Logic, founded by Spock, and joined by Data and Seven, against Team Passion, led by McCoy and handed off to Worf and Tom Paris. The Captains served as referees. Much of the science strayed far into make-believe territory, with random results attributed to “rifts in the Space-Time Continuum” and so on. None of this stopped me from watching and enjoying it, by the way, and I may be the only man alive who was more entertained by Seven’s dry wit than her skintight costume. Whether Star Trek’s science was good or bad, the series and the franchise had an enormous influence. Does Science Fiction have to be about science? I’m not convinced. Many pioneering SF authors were more interested in futurism and exploring social trends. Overpopulation came up a lot: Kornbluth’s “The Marching Morons”, Ellison’s “Make Room, Make Room” (led to the movie Soylent Green), Nolan & Johnson’s Logan’s Run, Brunner’s Stand on Zanzibar. Science was portrayed, and it played a part, but I hardly think these writings were about science. My high school considered offering Bradbury’s Fahrenheit 451 as an SF addition to the curriculum. I wasn’t fooled for a minute. It wasn’t about science, it was about literature. Did Kurt Vonnegut write about science? If he did, I was too busy laughing to notice. The Hitchhiker’s Guide to the Galaxy, ditto. Should we deny that these are SF? Some perhaps, but not all. Nowadays, the term Speculative Fiction is becoming more widespread. It solves the problem of differentiating Fantasy from Science Fiction by lumping them together. Conveniently, it shares the initials of SF, and saves us from writing SF&F or SFF. It also allows authors who dabble in both to keep all their books on one shelf in the bookstore. A more useful and specific term is Space Opera. It’s a handy label for stories that involve spaceflight (usually faster than light, without explanation) and plots that feature planet-hopping and, dare I say it, rayguns. Unfortunately, Space Opera can have negative connotations. It usually implies a form of SF light, and I suspect that John Scalzi, author of the Old Man’s War series, would frown if it were applied to his work. The label Hard SF is also tricky. Used precisely, it separates Ringworld from Gravity by applying a math test. Yet many casual afficionados might lump both those works into the Hard SF subgenre because science is central to both. All orbits are not equal, and you cannot actually cause a chain collision of satellites as if they were all on the same freeway. Whoa, I’m coming up on a thousand words, and I’m going to wrap this up. I posed a question, and I don’t have a definitive answer. I won’t say of Science Fiction that “I cannot define it but I know it when I see it.” I may not be able to define it, but I’m also not always sure when I see it. People who don’t like Star Wars may say they dislike Science Fiction, and still enjoy one of those James Bond movies listed above. What they really mean is they don’t like Space Opera. Many books and movies that are marketed as Science Fiction seem more like Horror to me. Alien, for instance. Earlier, I mentioned Jurassic Park, which I think also fits the monster movie subgenre-it just has a trendier setup than Godzilla. I urge you to think about what Science Fiction means to you, and to be specific about what you like or don’t like. I suspect that in one form or another, there is Science Fiction for almost everyone. My editor wants me to provide a style guide for my manuscript. One particular I am struggling with is the use of italics. I would like to employ them sparingly, but it is important to remember that they can enhance clarity. In my naivete, I thought she would simply correct instances where I had misused them. Alas, it is not that simple. The Rules, it turns out, are unwritten. Not all of them. Everyone agrees on the use of italics for book titles: War and Peace. Ship names: H.M.S. Sussex. Things like foreign words, although disagreements creep in as to whether this should be done every time, or only in the first instance. There is broad agreement on their use for emphasis: ‘Do you want to die?’ Then it all goes downhill. Should italics be used for sound effects? Strunk and White make no mention of it, and I couldn’t find anything in two of my other favourite reference books, Woe is I and Usage and Abusage. I’ve seen it done, though. Internal monologue seems to be a particularly divisive case. Some editors rail against it, some clearly permit it. I set out to answer the question by skimming the first one hundred pages of three novels from my bookshelf. The Golden Compass was written by Philip Pullman, who is British, but it is an American edition. Laurel-Leaf is an imprint of Random House. Mr. Pullman’s use of italics is sparing, almost Spartan. In a hundred pages, I found only twenty seven instances of italics used for emphasis, all of them single words. Also a handful of foreign words, and a couple of words discussed as words. I searched for italics in internal dialogue, but Mr. Pullman cleverly used Lyra’s daemon Pan as a device; Lyra voices almost all of her thoughts out loud to him. I found few unambiguous examples of internal monologue and no italics used that way. Conclusion: it is possible to write a novel with minimal use of italics. The Hunger Games was written by Suzanne Collins, an American, and published by Scholastic. It is the only one of the three novels I looked at to be written in the first person. Ms. Collins uses no italics at all for the first twenty pages, and in the one hundred pages I checked, I did not find a single example of italics used for emphasis. She does, however, use them for internal monologue. Usually, these are short sentences with the tag, ‘I thought’ or, ‘I remembered’ attached. Yes, there is an element of emphasis to those phrases. I also found a couple of foreign words, a handful of words as words, and a single sound effect. Conclusion: the use of italics for emphasis and for internal monologue are optional. Wake was written by Robert J. Sawyer, a Canadian who writes in American English, (I asked him) and published by Penguin. Italics abound. Mr. Sawyer uses them for emphasis on almost every page and he uses them wholesale when Caitlin is typing; she is a heavy user of social networking. This is a good example of effective use of italics to enhance clarity, because the reader always knows what Caitlin types, as opposed to what she thinks. There are numerous other uses of italics, such as the names of scientific journals. Pages entirely free of italics were rare. Conclusion: italics can enhance clarity, even when used more freely. It is a good thing I looked at three novels, not one. Each of the books I checked used italics in vastly different ways. Obviously, there is a large amount of leeway; no wonder my editor wanted me to set my own ground rules. There is one more way of using italics that I have only hinted at so far. Although Mr. Pullman does not permit Lyra to speak with her daemon telepathically, many fantasy novels do feature some form of mental communication. In my own work, two of my characters become linked by a technology that allows them to speak silently to one another, and it even happens involuntarily now and then. In order to make it clear when Raven’s thoughts are heard by Mel, italics are the way to go. However, the ‘comm’ is also used for routine calls, in much the same way that I use my cell phone. I do not think italics are called for in those instances. I will have to develop rules, because I need to be consistent so that the reader will understand. I welcome comments, not only from writers, (a handful follow this blog) but anyone who reads. Do you like to see italics used sparingly, or whenever they might enhance clarity? I had a very good weekend at KeyCon in Winnipeg. I can’t say my ship came in, but I would say I found my way to the wharf. I should begin at the beginning. It would have been easiest to drive from Kenora to Winnipeg on Saturday morning, but I took a vacation day on Friday so that I could do the full weekend. The main reason was that on Friday evening, Chadwick Ginther and S.M. Beiko were doing readings together, and they both got nominated for Aurora Awards this year. Besides, Samantha recently became my freelance editor (just before I found out she was nominated – bonus!) and this would be my first chance to say hi in person since we began working together. Also on Friday night was a presentation on aero engines by Lindsay Kitson, and I feel a special kinship with her because like me, she is writer and a pilot. Interestingly, if I understand her right, she views her Dieselpunk as being more fantasy than SciFi. 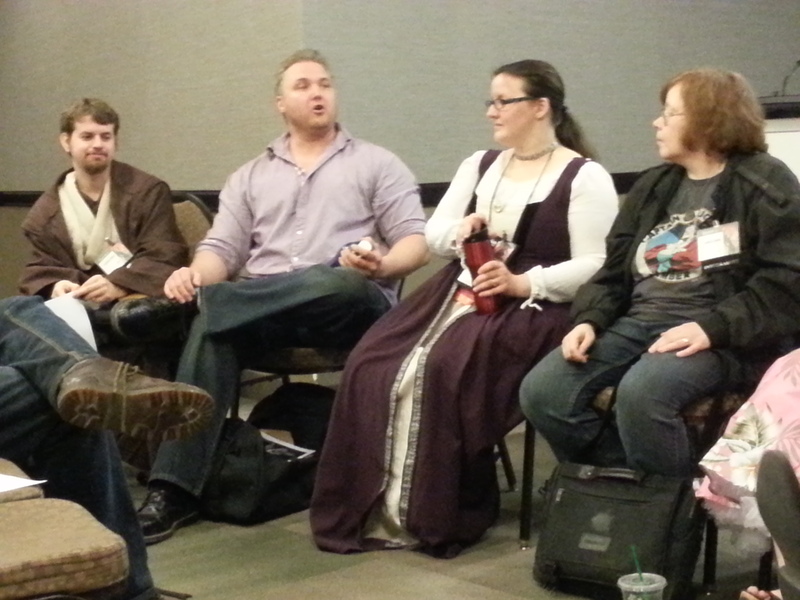 Even at a Speculative Fiction event, I sometimes feel like I am the only Science Fiction writer in the room. Unless Rob Sawyer is there. Then I feel like he’s the only Science Fiction writer in the room. Chatted to G.M.B. Chomichuk, who was working on a large painting right by the grand staircase. Said hi to Silvia Moreno-Garcia, who did a ten-minute blue-pencil session with me at last year’s KeyCon that led to some good changes to my book. Told her so. Went to the art show, looked for potential cover artists. Met one guy, got website info on another. Bought books from Leia Getty and Clare C. Marshall. Went to ‘Locally Grown’, an impressively large panel of Winnipeg Speculative Fiction authors and illustrators. Jonathan Hatton, Adam Knight, Lenora Rose Patrick, Laurie Smith. Samantha Beiko, Gregory Chomichuk, Chadwick Ginther, Lindsay Kitson, Karen Dudley, Leia Getty. Said hi to Karen Dudley because she did a fun reading at Word on the Water in Kenora last fall. Mentioned how happy I was to have Samantha editing for me. Karen asked, ‘Are you the author Sam was raving about on facebook?’ I didn’t know how to answer that; I don’t have a facebook account, and I wasn’t sure what Sam might have said. Spotted my nephew and his family at lunch, so I actually got to eat with them. Wonderful to have a little grounded time with them, it was a interlude of tranquillity in a day of commotion. Got Rob Sawyer’s autograph in Wake, told him how much I liked his character Caitlin, who is probably the youngest of his protagonists. Learned more about teaching from G.M.B. Chomichuk. Specifically, I noticed that not only did he answer a question with bang-on material from his own work that led to a fascinating discussion of a whole new topic, he made sure to conclude that topic by explaining how it answered the question, keeping us all in the relevancy loop. Went to a panel on Indie/Small Press/Big Press because Silvia, met Lenora Rose Patrick, who wrote a novella, and Adam Knight, a former pro wrestler turned author. ‘It’s all story-telling,’ he said. Decided on the spot to go to more of his panels. Some would say that the social evenings are the heart of conventions. When pressed, I make excuses, but the truth is, I have ascetic tendencies. That’s a fancy way of saying I’m a wet blanket when it comes to partying. Or a polite way of saying I’d rather talk to you when you’re sober. Whichever you like, I finished my day at KeyCon at the unfashionably early hour of 1800. I went for dinner with my wife and an old friend. Donna has a facebook account and a smartphone, so while we were waiting for food, she looked up Samantha Mary Beiko so we could see if her ‘ravings’ were about me. Wow. They were. I don’t think anyone has ever said anything so nice about me behind my back before! After dinner, in the peace of Donna’s living room, I checked something on my own smartphone. 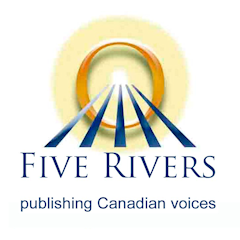 Months ago, I entered a writing contest held by NOWW (Northwestern Ontario Writers Workshop) because the genre category this year was Speculative Fiction and the judge was Robert J. Sawyer. I figured it would be a chance to get him to read one of my short stories, if I could get it short-listed. The judge, you see, only gets to read the best six entries as selected by a screening panel, but I figured it was worth a shot. I had heard nothing from NOWW except a reminder that the annual meeting (at which the winners would be announced) was the day before KeyCon. I could not swing Thursday off as well as Friday, so I could not make the trip to Thunder Bay. I was checking the website on my smartphone to see who won, and if I got an honourable mention, which might imply I was short-listed. I won. First place in Speculative Fiction for my story ‘Fermi High’. The first thing that crossed my mind was not that I would get some money, or even that my story would be published in the NOWW newsletter. It was that I had shaken hands with Rob Sawyer just hours ago, and neither of us knew that he liked my story. That is to say, he didn’t know who wrote it, and I didn’t know that he’d read it, much less chosen it for top prize. Apparently, the contest judging is so rigorously anonymous that the only way Rob could have seen who the prizes went to was to look it up on the NOWW website like I did. With good things happening on both the novel and short story fronts, I went to sleep with a grin on my face. By Sunday morning, Rob had retweeted my tweet about winning the contest, and a little later he added his personal congratulations. I ambushed him on the way into his reading to thank him personally, and we had a short conversation while people were taking their seats. He said I should send ‘Fermi High’ to Analog or Asimov’s Science Fiction and mention the contest and his name in the cover letter. Then he introduced me to the whole room before starting his reading, which was a cool look at a work in progress. Went to the market again, bought a nostalgic Andre Norton paperback, one of the ones she wrote under her (rare) Andrew North pseudonym. And an old copy of Fantastic Story magazine, which I picked up because of the cover, but hey, Ray Bradbury and Henry Kuttner. More readings: Karen Dudley, because she’s always a blast and she’s just releasing her newest. Adam Knight to see what he’s about. He read fearlessly from one of his prologues, and explained why he uses them even though they are unfashionable. Different voice and different perspective were good arguments. Last, a panel on Marketing & Publicity by Rob and Samantha. Short version: don’t push. Slightly longer version: don’t push your book on people who probably will not like it – you will waste their money and lose their respect, which will build nothing. Rob answered my question about what a big publisher can do that an indie cannot; not in vague terms like ‘placement’ and ‘connections’, but solid examples like transit and newspaper advertising, and book tour support. On the way out, before leaving, I had a few more words with Lindsay Kitson, who I hope is on the brink of success, and Holly Geely, who is funny and must not quit.